Eastern Highlands is a highlands province of Papua New Guinea. The provincial capital is Goroka. The province covers an area of 11,157 km², and has a population of 579,825 (2011 census). The province shares a common administrative boundary with Madang Province to the north, Morobe Province to the east, Gulf Province to the south, and Simbu Province to the west. The province is the home of the Asaro mud mask that is displayed at shows and festivals within the province and in the country. It is reachable by air and road transport. Eastern Highlands Province is made up of rugged mountain terrain and broad valleys. It has low coastal areas in the Markham and Ramu valleys. The Province's two highest peaks, Mt Tabletop and Mt Michael are located on Kratke and Bismarck Range respectively. They rise at a height of more than 3,000 metres above sea level. Specifically, Mt Michael is situated 3750 metres above sea level while Mt Tabletop is at 3,686 metres. Asaro and Lamari rivers both flow into the Puraari which is one of PNG's five major river systems. The Yonki Hydro-Power Station is fed by the Ramu river. 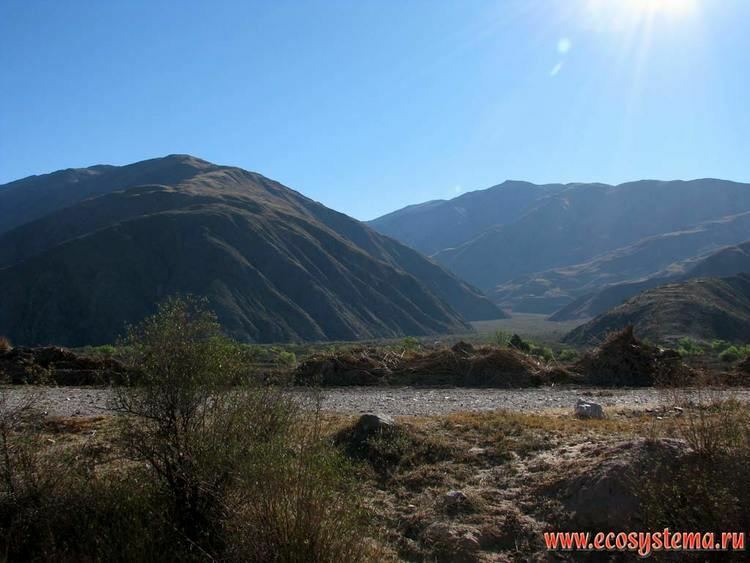 The Province is entered through the Kassam Pass and exited to other Highlands provinces at Daulo Pass. 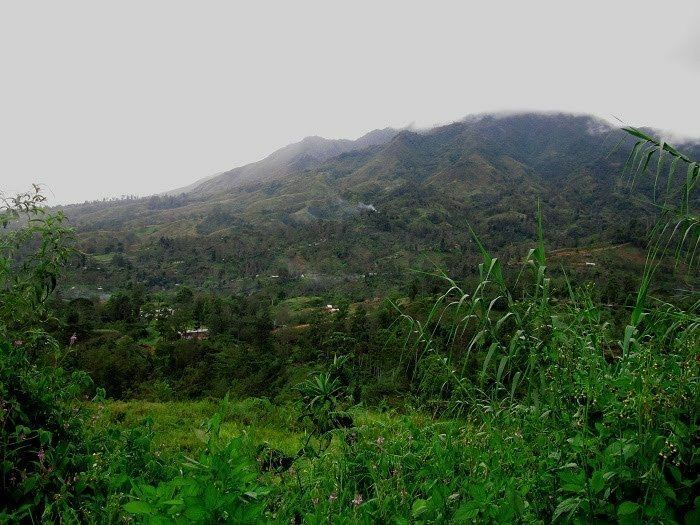 Kassam Pass offers a picturesque view of the Markham and Ramu valleys while Daulo Pass reveals a breathtaking view of Goroka's lush, green valleys. Monthly rainfall follows a seasonal pattern with a wet season from December to early April having mean monthly rainfalls of about 203 mm to 305 mm. A dry season follows, with monthly falls in the general range of 51 mm to 102 mm. The months of April–May and October–November tend to be transitional. Temperature ranges are more equal. At Goroka the maximum temperature for whole year is 26 °C. At Goroka, mean humidity varies from 87% at 09:00 hours to 57% at 15:00 hours. Associated with this typical cycling of cloud movement found in the Highlands in the early morning valley slopes and bottom are submerged in fog with high hills and ranges protruding into clear sunlight. As the day progresses the fog lifts from the valleys and clouds begin to form on the ranges frequently with associated local convectional storms. Towards the evening the cloud extends from the ranges to the valleys and with cooling sinks to valley bottoms. This cycle of afternoon cloud and storm on the ranges and morning fog in the valley bottoms, where airstrips are located, makes the maintenance of flight schedules difficult. Grasslands dominate a broad area of land especially in the valleys which is predominantly inhabited by people. This is a result of continuous burning and excessive use of the land to do gardening. Secondary forests and shrub regrowth formed in primary forest locations, which takes longer to grow due to continuous burning. At higher altitudes as in Bismarck and Kratke ranges, the vegetation type is mountain rainforest dominated by beech forest and pandanus species. At much higher altitude over 3,000 metres, alpine grassland and moss forest are common vegetation type. At lower altitude (1,500 metres or less) especially towards border areas of coastal provinces where there is very high rainfall and humidity, lowland rainforest is found. The vegetation type is very diverse and heterogeneous in species composition and is home to a diverse range of exotic flora and fauna. 18,000 years ago – people lived in the Lamari valley in rock shelters. 11,000 years ago – inhabitants at Kaliavana, Asaro Valley. 9,000 years ago – trade links with people along the coast, were still hunters and gatherers. 1927 – Lutheran missionaries in the Asaro and Bena valleys. 1930s – Arrival of Australian gold prospectors and kiaps to the Province. 1942–1945 – World War II – many villagers worked as labourers or carriers for the Allies. 1943 – Benabena airstrip (an ANGAU base) bombed several times by the Japanese. 1946 – Goroka becomes an administrative centre. 1950s – First road link from Goroka to Lae completed. Expatriates began growing arabica coffee in Goroka and Kainantu which becomes PNG's top cash crop. 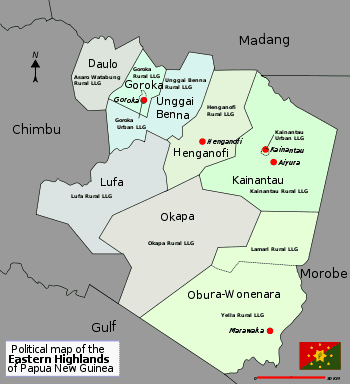 Eastern Highland Province had a population of 432,972 (PNG citizens) and 1,173 (non-citizens) in the 2000 Census. This is an increase of 31% since the 1990 Census figure. The province makes up 8.3% of the PNG population, which is the fourth highest population in the country after Southern Highlands, Morobe and Western Highlands provinces. The population distribution among the eight districts of the province ranges from Obura/Wonenara with the lowest population of 29,688 to Kainantu with the highest population of 1. The capital of the province, Goroka town has an urban population of 19,523 which is 27% of the Goroka District population of 71,870. The other major town of the province, Kainantu town, has an urban population of 6,788. About 94% of the population live in the rural areas. The population density of the province is 38 persons per square kilometre, with an average household size of 1.4 persons. The average annual growth rate of the province has increased significantly, from 0.8% between 1980 and 1990, to 3.6% between 1990 and 2000. This was slightly higher than the national average annual growth rate of 3.6% between 1990 and 2000. This is slightly higher than the national average annual growth rate of 3.2% for the same period. With such a population growth rate, the province can expect to have around half a million people in the next five years. 44% of the population are literate (males having higher literacy rates). 69% of the population are married. More women married than men (72%–65%). 95% of the population are church-goers. 38% are Seventh Day Adventists, 30% Evangelical Lutherans, 12% Pentecostals and 6% Evangelical Alliance. Eastern Highlanders are regarded as the friendliest people in the Highlands and have fewer tribal fights compared to other Highlands provinces. The villagers are hard-working people attending to their food gardens and livestock while the educated individuals find work in the cities or towns. Intermarriage by Eastern Highlanders to people of other provinces and cultures is a common trend. There are many people from all over the country and expatriates who have made this province their home either because of work or marriage. Traditional housing is built in a circular or rectangular shape. The walls are weaved from pit pit canes or bamboo. They are built low to keep the interior warm from the cold climate and the high thatched roof keeps the smoke away from the inhabitants. Cooking and sleeping is done in this communal, open-space living arrangement. Traditional homes today use a touch of modern influence and style, with the inclusion of windows and rooms. There are various ways in which traditional cooking is done, either by using bamboos, roasting sweet potatoes in the open fire or the ground oven style of cooking called "mumu". Vegetable gardening and tending to livestock is very important to the village people as this is their source of wealth and identity. Vegetables and livestock are given as contribution during funerals, marriages and other festivities. At traditional wedding ceremonies, the groom's relatives give money, food and other gifts to the bride's relatives. This bride price is an act of buying the bride from her family, who now has responsibilities looking after her husband's relatives. Today's weddings have a combination of modern and traditional styles, a church wedding and payment of bride price before or after the wedding. As with any other transitional society, (moving from traditional times to suddenly be competing in the 21st century, on the free market), the Eastern Highlands has witnessed its fair share of law and order problems. Most problems stem from the fact that the majority of the youth are not engaged in gainful employment or other productive activity. Most problems relate to petty theft and pick-pocketing. Visitors are therefore advised to leave all valuables in their hotel deposit safe And further carry minimal valuables on person whilst moving about. When traveling on PMVs or to unknown areas, visitors should speak to officers at the nearest police station for a status report on their destination. Tribal fighting in the region of Gimi has been going on since 1986, many of the clashes arising over claims of sorcery. In November 2008, it was reported that in Agibu and Amosa villages women had agreed that if they stopped producing males, allowing only female babies to survive, their tribe's stock of boys would go down and there would be no men in future to fight. They agreed to have all newborn male babies killed. It is not known how many male babies were killed, but it had reportedly happened to all males over a 10-year period and probably was still happening. Goroka has the J.K. McCarthy Museum that specialises in historical Highlands artifacts and information, The Raun Raun Theatre who are the national traditional performing arts troupe, National Sports Institute, the Papua New Guinea Institute of Medical Research, which researches health-related diseases and experiment to find new vaccines for these diseases. Due to its location along the Highlands Highway, the province is a regional trucking centre, having one of the Highlands region's major trucking company's operating in Goroka. The East-West Trucking company freights cargo and provides service to the entire region. Apart from that, there are other private trucking firms that freight cargo. The province's economy lies in the production and export of coffee, which provides the economic backbone and livelihood for all Eastern Highlanders. Leading exporters of coffee based in the province are PNG Coffee Exports and New Guinea Highlands Coffee Exports as well as ground coffee manufacturers Goroka Coffee Roasters, Kongo Coffee and Arabicas Ltd. The Coffee Industry Corporation headquarters is in Goroka. The country's largest hydropower station is in Yonki, Kainantu, and others like the Kainantu pottery and wool rugs and a new gold mine in Bilimoia has commenced construction. Aiyura valley is home to stations that research methods of planting and livestock breeding in the Highlands region. Research stations include the National Agriculture Research Institute, Coffee Research Institute and the Highlands Fisheries. Aiyura National High School is a part of the valley, including the Summer Institute of Linguistics who specialise in translating Bibles into the languages in the country and provide literacy and linguistic training. The economic state of the Eastern Highlands Province has declined with the economic situation of the country. In addition, the deteriorated infrastructure of the province hinders economic growth. The province derives most of its revenue from the production of coffee. Eastern Highlands is the leading producer of coffee in the region. It produces large quantities of coffee annually for export. Almost all rural households in the province own a small plot of coffee as a family project. Many families supplement their income by engaging in small agricultural and livestock businesses. The introduction of vanilla, wheat and rice has had a huge impact on agricultural enthusiasts throughout the province. Rice and wheat is being grown for own consumption and/or selling while the vanilla is sold to the international market. Pigs, rabbits and especially chickens are readily farmed while fresh vegetables are grown for the local and national markets. There are approximately 250 primary schools in the Province plus 11 high schools and 1 national high school. They are run by the church or belong to the government. The University of Goroka — one of PNG's national universities, established as an education college of the University of Papua New Guinea — is in Goroka. It produces qualified teachers for high schools, secondary schools and national high schools throughout the country including students from neighbouring Pacific Islands.